I have a fun item that I like to use as doll risers on display in my Barbie room: Individual Cupcake holders. I find that as I work towards creating clean and organized displays, I’m always looking for “risers” that are not obnoxious to the eye. In the past I’ve used boxes and even soup cans. But recently I’ve discovered that I really LOVE the cupcake holders. In addition to being the **perfect** size to accommodate all different sized doll stands, they are super cute and they come in so many great colors. They add interest to displays. Today I found some really cute porcelain cupcake holders at Home Goods . These come in so many fun colors and designs, I found that I had quite a difficult time choosing! Here are two examples of other colors that were available. I struggled … I wanted them all. They come in a set of 4, and were priced at $9.99 for the set. I settled on these two sets: ballet slipper pink w/gold and white w/gold. I try to maximize space in my displays. Below you can see how I stagger doll display height within shelves that will accommodate the layers. Sometimes this is necessary when you have a shelving unit that requires a stationary, non-adjustable permanent shelf, usually right smack in the middle of the shelving unit. Depending on what you’re displaying, that designated permanent shelf sometimes affects the ability to have all the rest of the shelves the same unified height. In that case, I take advantage of layering, which requires the use of risers. Here is display shelf that I display my repro Barbies on. In this case, my shelf height needed to be quite high to accommodate the Barbie Vintage Fashion Shop, which causes an unsightly gap between the ceiling of the shelf and the dolls. I hide the gap with staggered dolls. It is also a great way to cram a bunch of dolls into a small space! Behind the shoe display you can see the new riser peeking through. Here is what is really going on behind the shoes. I still wanted something pretty because you can see the riser peeking through. Before: In this vignette I used stacked Mattel stand bases. Lastly, I want to share another style cupcake holder that I found at Home Goods months ago (these I believe were 5 or 6 bucks each). This one is taller and also works great for layering. I want to say there were three colors: pink, robins egg blue and white. My natural instict would be to grab the blue, but this time I went for the pink. These are metal and they are packaged individually in a darling tulle net bag. Of course the cupcake holders will come in handy for what they are intend to be used for, but in my house, highly doubtful 🙂 !!! 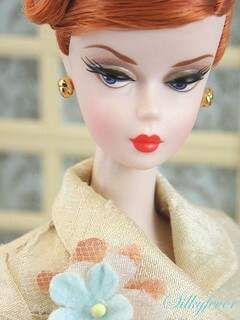 Today is Barbie’s Birthday! I did get a gift in the mail for her birthday today … I received three vintage Barbie’s back from doll restorer/artist Debra Marsteller and have been oohing and ahhing over their beauty all afternoon. I’ve also been celebrating Barbie’s special day with swapping out some displays in my Barbie room, will share soon! So thankful to have such a fun hobby in Barbie! Hope you all are having a scrumptious pink frosted cup cake in her honor today! Its January here in the the Pacific Northwest, and we have been experiencing some bitter cold temperatures, ice, and a few light dustings of snow. 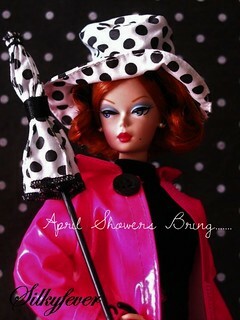 In this weather I try to take advantage of being locked indoors by spending time in my doll room. Today I should have been organizing the room and cleaning up messes that have accumulated as I rework displays/redress dolls/find homes for new dolls recently added to my collection. Lately, as I tackle mini-projects in my room, I find myself constantly tripping over a large vignette backdrop that has romantic snow drifts in the windows. I think a lot of us are experiencing some blistery cold weather around the US right now. So today I found myself inspired to do a quick wintry photo shoot with this backdrop, rather than sticking to my original priority of tidying up. Oh well, lots more winter weather will arrive this next month, bringing plenty of time to clean later, ya? (I tell myself this to ease the guilt!). I created a very quick winter vignette called “Barbie’s Book Nook”. Barbie is escaping a cold New York snow storm with an apropos book titled “Barbie’s New York Summer”. She has created a reading nook near an oversized window in her NY brownstone (you can see the skyline outside the window, through the heavy snow fall). During these bitter winter months many of us are finding ourselves plopping down on our sofas or favorite reading chairs, grabbing some warm tea, throwing on the reading glasses (I cannot read without them these days!) and taking time to read a good book. Others are taking time to have photo sessions with dolls. I guess I find myself doing a bit of both. Barbie’s chaise lounge awaits with a good book and a hot cup of tea! So being the display junky that I am, I picked it up – for $20. Its made of some heavy duty plywood painted a perfect shade of creamy white. 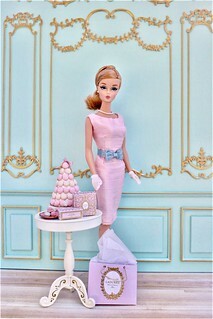 It is going to be a wonderful addition to my doll room. 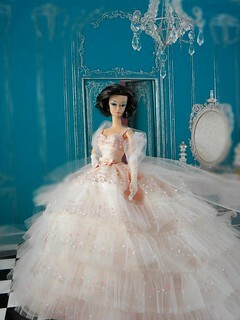 It will be great for highlighting whatever dolls inspire at the moment, and has great enough room for 3-4 dolls easily. I’m not one for overcrowding in my display/vignette boxes, so I will probably utilize it like I do with the Plexi-cubes I’ve shared in earlier posts. It will easily accommodate large pieces of 1:6 scale furniture as well. It is nice to have the option of keeping the back open, but if I know myself well enough, I will be fully tempted to add a papered back wall to add a dramatic effect to the display. It is always a treat to find something like this fixture when you least expect it. But I do have a huge regret. I should have purchased two or three more. Now that I have it in my doll room, I can see it matches my Ikea Isala cabinet almost perfectly, which is where I plan on displaying it. A couple more of these shadow boxes arranged on top of my cabinet would have made a lovely presentation. I would drive back, however, this Macy’s location is in a small beach town 5 hours away. Live and learn. I’ll be happy with the one I have. Update @ 3/19/2016: Ask and you shall receive. I was fortunate enough to add two more of these cubes. My husband had to go back to work in the area of the store closing, and was awesome enough to pop in and grab two more (albeit, they are missing their plexi, but I can easily remedy that problem). I can’t wait to put these to use for a great display!